There are many devices on the market that promise both efficiency and functionality, and the Lifespan Fitness TR800-DT5 Desktop Treadmill is no different. 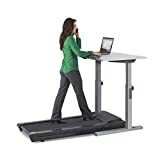 Combining a treadmill and a desk, this machine is great for working while you work out. Retailing for $1,197.01 on Amazon, this treadmill is one of the most economical workout/workstations on the market. With adjustable speeds up to 4 mph, a built in step counter and Bluetooth capability, the Lifespan Fitness TR800 is a feature-packed machine built for encouraging peak productivity. The included workspace is large enough to hold your laptop, small devices and water bottle, yet compact enough not to be bulky and cumbersome. The desk is made from laminate and is set on a steel frame. Intelli-Guard automatically pauses your workout if you step off of the treadmill. This is a built in safety feature that ensures that you never get hurt if you encounter a health emergency during your workout. If your foot leaves the belt for more than 20 seconds, the machine will pause automatically. Intelli-Step works as a built-in pedometer, measuring your steps and displaying them on the digital readout. Intelli-step automatically measures your foot striking the surface of the belt and calculates how many steps you have taken during your workout. 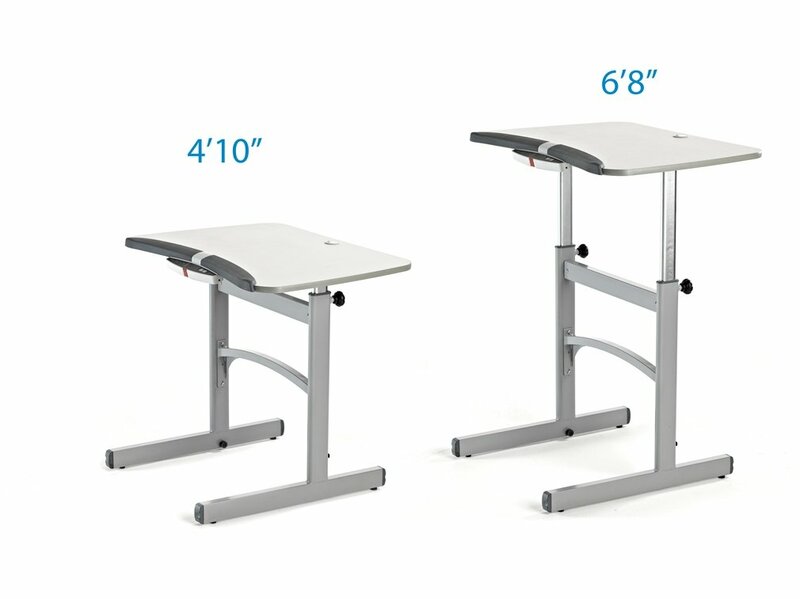 The ability to adjust the height of your desk is vital for proper ergonomic support and the alignment of the spine and wrists. This a useful feature for those that suffer from conditions like sciatica and carpal tunnel syndrome. If you are taller or shorter than average, adjusting the height will allow you to make the most out of your workout without straining to use your desk. When it comes to price, the TR-800 DT5 is on par with its competitors. This model is the upgraded version of the TR-5000 DT3, its immediate predecessor. The newer model adds in the customized workout plans and adjustable height feature. With less than $100 difference in price, this makes the TR-800 both efficient and cost-effective. Many users who have used the TR-800 complain about the stability of the machine. Some users report that the treadmill shakes slightly at higher speeds, making it hard to concentrate on work. Many reviews report that typing is a challenge and only feasible at lower speeds. Another user gripe is the Intelli-Guard system that stops the machine when you leave the treadmill for more than 20 seconds. While this feature is in place to ensure your safety, it can also be a hassle for those that have to step on and off frequently. Each time you return, the system has to reset itself, which can be a pain. Some reviewers on Amazon report that standard delivery only includes drop off at the front door. The treadmill comes in two boxes, one that weighs 80 lbs and the other that weighs 100 lbs. The company does, however, offer the option of having it delivered to a location inside your home for an additional fee. The LifeSpan Fitness TR-800 DT5 is great for people who want to incorporate physical activity with work to enjoy maximum efficiency. This machine offers a complete fitness app and step tracker that will help you to measure and reach your goals faster. While there are others on the market, few offer as many features for the low price of this model. For those that want to increase their steps taken and overall physical fitness, this desk repairs the damage caused by sitting in one spot for 8 hours a day. For the exerciser that wants to enjoy both fitness and productivity, the LifeSpan Fitness TR-800 D5 is an excellent choice.